Looks like the folks at Bay Cove Home Services were so impressed by our workshop in partnership with the Kit Clark Center for Change that we made the front page! Wanna learn more about the inner workings of our writing workshops? 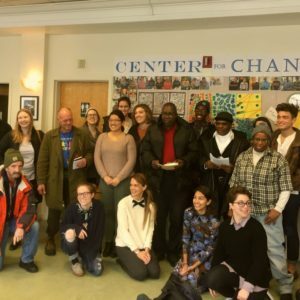 Check out this collaborative reflection written by Cheryl Buchanan, our Executive Director, and Massiel Torres, a student at Emerson College, detailing their experience with the ReVisionaries, a writing partnership between clients at the Center for Change and a group of dedicated undergraduates from Emerson College! Even the James E. Rogers School of Law is Interested in Our Work! Alumna Cheryl Buchanan (’00) is founder of the non-profit organization Writers Without Margins, which brings writing workshops to homeless shelters and other human services organizations in the Boston area. After graduating from Arizona Law, Cheryl began her legal career as a media lawyer, working in Las Vegas with James E. Rogers. She was General Counsel for 10 NBC affiliate stations owned by Intermountain West Communications (formerly Sunbelt Communications). “grounded in her experience as an attorney in California where she assisted more than 500 survivors of child molestation, helping them to tell their stories as an integral part of personal recovery from trauma” (see full bio here). Cheryl began to teach writing at the college level in 2004 and has done so ever since. She has also been the creative director of an international television production company, Handbook Productions, which created content for the Discovery Channel. In 2015, Cheryl obtained an MFA in writing, literature, and publishing from Emerson College. As part of her coursework, in 2014, she began conducting writing workshops with clients at two local homeless shelters in a project of her own design. The Writers Without Margins organization, formed in June of last year, is an extension of that project. Writers Without Margins has published print and documentary videos featuring participants in the workshops. The commitment Cheryl has shown to giving voice to her clients through her law practice and now in her writing and teaching within marginalized communities evokes the true meaning of the word advocacy. Writers Without Margins in The Berkeley Beacon! Check out this great article by The Berkeley Beacon on the origins of Writers Without Margins, an overview of the work we do, and what’s up next! Writers Without Margins on the ARTery! Check it out! Writer, Sara Willig, and our founder, Cheryl Buchanan, had the chance to sit down with Bob Oakes, host of WBUR’s Morning Edition, to talk about the work we do and why it’s so important! Join us on September 22nd, 2016 for a poetry reading from 4:00 PM -5:30 PM. The poetry reading will be held at the Community Church of Boston, located at 565 Boylston Street, next to the Globe restaurant across from the Trinity Church.